By CNN'S KAYLEE HARTUNG, NICOLE CHAVEZ, DAVE ALSUP AND HOLLIE SILVERMAN CONTRIBUTED TO THIS REPORT. 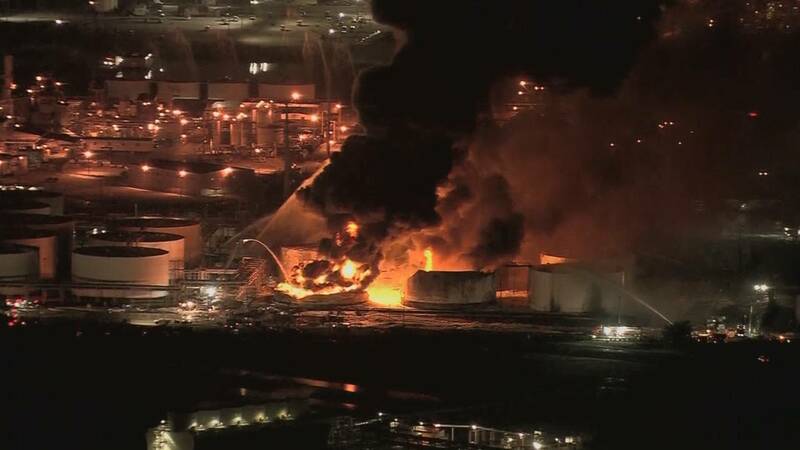 A secondary fire that broke out Friday at a petrochemical storage facility in Deer Park, Texas, was caused in part by the breach of a secondary containment wall, officials said at a news conference Saturday. Three tanks at the Intercontinental Terminals Co. facility reignited Friday afternoon, just two days after an initial blaze that had burned for days was extinguished. Friday's fire complicated ongoing cleanup efforts that had been underway as a result of the first fire, which burned multiple tanks containing chemicals that go into making gasoline, including xylene, naphtha and pyrolysis gasoline, known as Pygas. No serious injuries have been reported as a result of either fire. The cause of the initial blaze is under investigation and remained so Saturday morning, officials said. Alice Richardson, an Intercontinental Terminals spokeswoman, said that some of the liquid stored behind the containment wall made its way Friday into the nearby Tucker Bayou. The liquid contained a "mix of the product from the tanks that burned in the fire, firefighting foam and water from our firefighting efforts," Richardson told reporters, adding, "Efforts are underway to remediate Tucker Bayou." Brent Weber, the company's incident commander, said the chemicals in the water are a mix of those contained in the tanks before the fires broke out. Officials from multiple agencies, including the Environmental Protection Agency and the Texas Commission on Environmental Quality, are monitoring the situation to determine the environmental impact and risk to residents of Deer Park, near Houston. "As soon as we find hazardous situations, we communicate that and get that out to the community," said Adam Adams, the on-scene coordinator for the EPA. The US Coast Guard is also on hand to help with cleanup effort in the bayou and the Houston Ship Channel, which was closed Friday, Adams said. The channel will be reopened once it is determined to be safe, according to Coast Guard Capt. Kevin Oditt. The cause of the breach is not yet known, officials said, but the containment wall is secure, and efforts are underway to strengthen it. The three tanks reignited at about 3:45 p.m. CT Friday, officials said, and the fire spread to some of the liquid that had escaped through the breach and was caught in a nearby drainage ditch. The blaze was extinguished after nearly an hour. A group of concerned residents gathered at an event put on by local lawyers Saturday afternoon, looking for legal guidance. The dozens of residents sought answers to questions concerning their property values or their businesses. But most voiced concerns over the potential consequences for their health and that of their loved ones. "We still don't know if any of us are going to be OK," said Steve Michaels, a longtime Deer Park resident, "or if there's going to be a long-term effect." "I don't know if my property value just dropped to nothing," he added. "I don't know if my soil is contaminated. We don't know if we can drink anything that's coming out."